Theresa May has apologised to Tory MPs for the party's election performance, telling them "I got us into this mess I'll get us out of it." Addressing a meeting of backbenchers, the PM reportedly said she would serve as "long as you want me to do". One senior backbencher told the BBC that she had appeared "contrite and genuine but not on her knees". It comes amid confusion over whether the Queen's Speech will be delayed as talks continue to form a government. A senior minister has said he was "optimistic" that the Conservatives and Democratic Unionists will reach an agreement in the coming days to allow a proposed Tory minority government get its plans for the year ahead through the Commons, possibly as early as next Monday. But First Secretary of State Damian Green said he could not confirm the Queen's Speech will proceed as planned on 19 June. Mrs May addressed a packed meeting of the 1922 Committee for 90 minutes after her failure to win the election outright prompted days of speculation about her future. 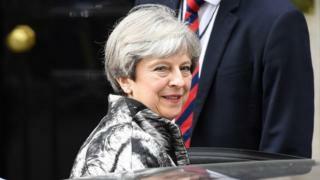 According to reports of the meeting, she accepted personal responsibility for calling the snap election and for the result, which saw her party lose its overall majority and have to rely on the support of others. Mrs May, who earlier chaired a two-hour cabinet meeting, reportedly told the committee, a group of backbench MPs, that the DUP would not have a "veto" on the government's agenda, and there would be no watering down of equalities laws over which the two parties disagree. The BBC's political editor Laura Kuenssberg said the PM's "colleagues were demanding contrition and sounds like they got it". While calls for Mrs May to go had "faded", she said her authority was "extremely fractured" and had acknowledged she was not "calling the shots" any more. His colleague Sarah Wollaston tweeted: "Conservative MPs all said they were standing with TM. As far as I'm concerned that hasn't changed." One Conservative ex-minister told the BBC that Theresa May "did brilliantly", suggesting that "the "Maybot" disappeared and we got a real leader back". In the wake of Friday's setback, Conservative figures have said the party needs to learn the lessons of its failure to win an overall majority and change direction in some key areas. May's cabinet: Who's in and who's out? Did Gove really try to stop teaching climate change? He told the BBC's Panorama his party had to listen to Remain voters about their concerns. Meanwhile his colleague George Freeman said it was time for the government to "drop a hard Brexit" message and return to a "message of hope" he said Mrs May articulated when she first became prime minister. Meanwhile, the Scottish Conservative leader Ruth Davidson has said the priority of Brexit talks should be the economy and free trade and that other parties should be involved in negotiations. After attending Monday's meeting of senior ministers and Tory officials, she said: "We do have to make sure that we invite other people in now. This isn't just going to be a Tory Brexit, this is going to have to involve the whole country." Passing the Queen's Speech - which is written by ministers and presents an outline of its planned legislation for the next Parliamentary session - will be the first major test of Theresa May's proposed minority government. If the government was defeated, it would be tantamount to a vote of no confidence. Mr Green cited the ongoing negotiations with the DUP when he was asked if next Monday's speech had been delayed. "I can't confirm anything yet until we know the final details of the agreement," he said. "We know those talks are going well and also we know that, at this very important time, we want to produce a substantial Queen's Speech." One of the reasons for the delay is also believed to be because the speech has to be written on goat's skin parchment, which takes a few days to dry - and the Tory negotiations with the DUP mean it cannot be ready in time. BBC assistant political editor Norman Smith said there was an "ambiguity" about both what would go in it - with several manifesto pledges expected to be watered down or dropped - but also the need for the Tories to "nail down" DUP support. The first formal meeting of UK and EU officials since the election has concluded without a date being officially set for the start of Brexit talks. The negotiations were due to start on 19 June but Brexit Secretary David Davis has indicated this timetable could slip by a few days amid events in Westminster. The prime minister is continuing to reshuffle her government at middle-ranking level after Sunday saw only modest changes in the cabinet. Nick Hurd has become policing minister while Dominic Raab joins the Ministry for Justice and Mel Stride becomes financial secretary to the Treasury. Mike Penning, Robert Halfon, Oliver Heald and David Jones have all left the government.